Income producing farm just minutes south of San Antonio features very nice turn-key improvements, 4 pivots, 2 irrigation wells, and much more. IMPROVEMENTS: A handsome, newly constructed 5,000±-s.f. main house is complemented by a 1,500± s.f. guest house, plus refreshing outdoor entertainment area including an outdoor kitchen, swimming pool and spa. Ranch improvements of a fully enclosed barn, 4 pivots with underground water & electric lines. WATER: The property has 2 Carrizo irrigation wells (1,000± GPM & 400±GPM) which service the 4 new TL pivots. There are also 3 stock ponds, a domestic water well, and city municipal water to both houses. 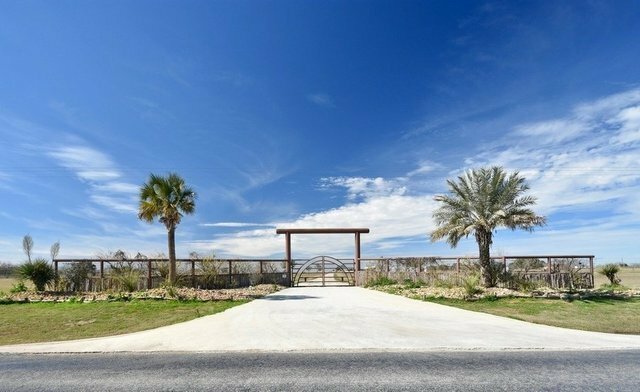 LOCATION: The property is conveniently located just 7± miles west of Jourdanton and only 45± minutes south of San Antonio and fronts on CR 2146.